I read this book for my book club, and it was actually my choice. I've read a couple of her other books, and when I saw this one was a possibility for our choices, I said I'd like to read it and would lead the book club on it. That's tonight, so I'm thinking up some questions to spark discussion, although we don't usually need much encouragement. The story is set in the North East of England in 1986. Liza was born just after midnight on the 1st of January 1900, so is as old as the century itself. She is living in the house she has been in for years, on an old terrace that is due to be demolished. Stephen is some kind of social worker, and is tasked with telling Liza that she must move. The two become quite close, and we read about the entirety of Liza's life. She was born into a poor family with many siblings, some of whom died in infancy. Liza starts work aged about twelve, and then sees her beloved brother Edward killed in the first world war. She has a hard relationship with her mother, and then marries Frank, a soldier who was hit in the throat and who holds seances for grieving widows and mothers. 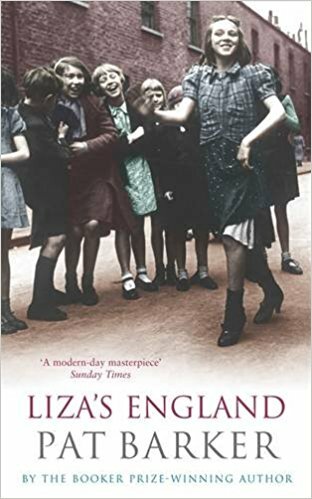 We go backwards and forwards in time with Liza throughout her life to her current situation, living in squalor and poverty in the front room of her house. Meanwhile, Stephen's partner is in America and Stephen misses him, and he's having problems with people and clients at work. He isn't close to his family but has to deal with his aging parents. I really liked Liza's life story and felt that she endured a lot of hardship and strife. The reader could see how the world changed in the 20th century through Liza's story. I found it harder to get on with Stephen, but I could see why his part was included. All in all, I give it nine out of ten.